News of yet another late-December 2009 sale as Kurt Bosshardt at Merle Wood & Associates tells me that he teamed up with Australia's Grant Torrens of Grant Torrens Marine to sell Trinity's 53.95m motor yacht Katharine. 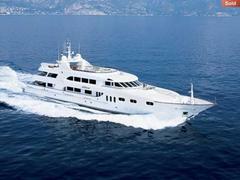 The deal closed on December 28th, with Mark Elliott of International Yacht Collection acting for the seller. Katharine was built in 2001 to ABS class and is MCA compliant, accommodating 12 guests in a master, VIP, two doubles and two twins and has a range of 6,500 nautical miles at 10 knots. Having had her asking price reduced in late October to $28.9 million, this superyacht heads off to the Rybovich yard next week for a five month refit, says Kurt.